A Moss rose. Paul describes the flowers as blush with pink centres, similar to ‘Maiden’s blush’, the buds very well mossed, growth vigorous. 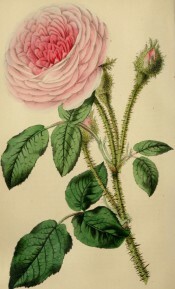 Rivers described it as a neat and pretty new blush Moss rose, its habit upright and very robust and vigorous. [Paul (1888, 1903), Rivers 1854]. Raised by William Paul c.1850. It seems that rumours circulated about the origin of this rose. William Paul defended himself in the pages of The Gardeners’ Chronicle stating that ‘Princess Alice’ was ‘not one of the “others” mentioned by Mr. Rivers as produced in France, the purchaser retaining the right of naming them, but raised by my own hands from seeds gathered and sown at the Cheshunt Nursery.’ [Gard. Chron 1857].